K-pop idols Big Bang was honored with the United Nations' "Global Unity" award over the weekend, according to their agency YG Entertainment. 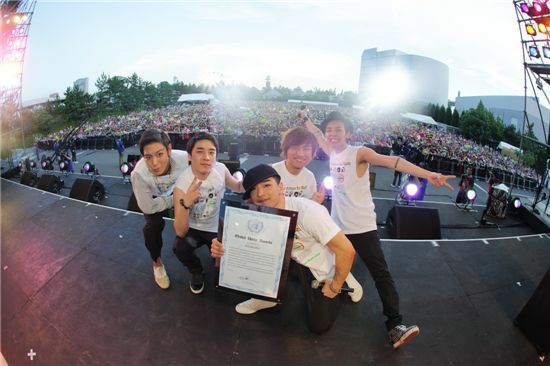 YG announced in a press release that the boys were handed the "Global Unity" award on July 24 during the "Asia-Pacific Global Tolerance with Music 2010" concert held at Universal Studios Japan in Osaka. The "Global Unity" award was given to the group for their endeavor to support the Haiti Rehabilitation efforts after the country became hit with a huge earthquake earlier this year. The boys donated money they made from their concerts for the cause and were acknowledged by the Friends of the United Nations for showing tolerance and promoting unity of humanity around the world. "We feel privileged to have received this meaningful award. We will work hard in creating music that will, at the least, help Asians understand each other better and bring developments", the members of Big Bang were quoted as saying. The quintet is the third recipient of the award -- previous honorees include former mayor of New York City Rudolph Guiliani and singer-song writer Alanis Morissette. Big Bang also performed their latest single "Beautiful Hangover", "Gara Gara Go!! ", "Number 1", "How Gee" and "Hands Up" at the show. "Asia-Pacific Global Tolerance with Music 2010" is a musical event where various singers come together to perform under the theme of 'tolerance and peace'. Other Korean artists at the concert were girl group 4minute and boy band BEAST. Known as one of the biggest cultural icons in Korea since making their debut in 2006, Big Bang crossed over to the Japanese pop market last June. They have released several Japanese singles as well as winning the Best New Artist Video for their second Japanese single "Gara Gara Go!! ", Best Pop Video for third single "Koe o Kikasete" and group leader G-Dragon won Best Collaboration Video for "Rain Is Fallin'" at the MTV World Stage Video Music Awards Japan in May.